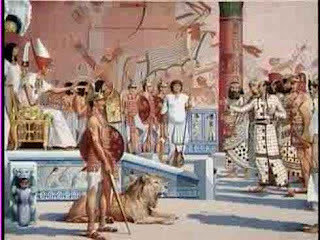 Throughout the history of the Egyptians there where several women who came to rule their people, but none was brave or ambitious enough to assume the title of King and Pharaoh, except for Queen Hatshepsut, or more accurately put…. King Hatshapsu (dropping the “t” of the end of her name made it a masculine name instead). 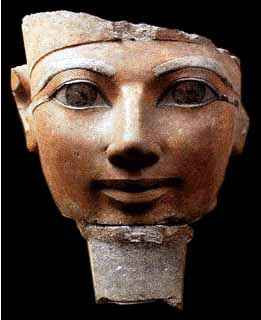 Before Hatshepsut there where queens who had ruled Egypt but until then ….never a female Pharaoh! Contrary to any ancient culture, where women were expected to stay at home, women of ancient Egypt had a lot more freedom. They were allowed to own property and hold official positions, they were also given rights to inherit from deceased family members and were allowed to present their cases in court. They also played a cardinal role in the religion, where religion was integral to a ruler’s role so royal women acted as priestesses and officiated at the rites in temples. 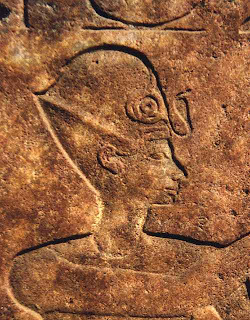 Hatshepsut ruled Egypt between 1479-1458/57. She was a unique and intelligent individual, who brainstormed, not only to legitimize her position as pharaoh but also make herself god-like, to win the complete approval of her subjects. Due to her boldness she may have been the first to start a Feminist movement to seek out prominent women from antiquity and publicized their achievements. Ma'at-ka-Ra Hatshepsut was the eldest daughter to Thutmose I and Queen Ahmose, the first king and queen of the Thutoside clan of the eighteenth dynasty. 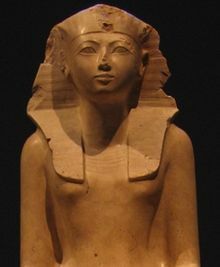 Upon the death of her father, Hatshepsut married her half-brother, Thutmose II, and assumed the title of Great Royal Wife. 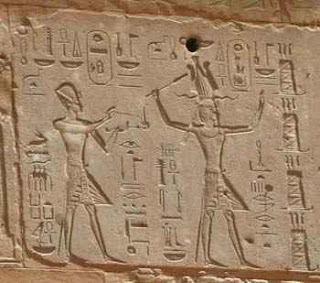 They had one daughter, Neferure, who Hatshepsut groomed to take over the roles she played as queen. Upon his death Thutmose II left behind a very young Thutmose III (born to Isis a lesser wife of Thutmose II) to succeed him. Being too young to assume the tasks of pharaoh, Hatshepsut became his regent not long before she proclaimed herself Pharaoh. After the Oracle of Amun pronounced that the will of the god Amun was that Hatshepsut should become Pharaoh; she adopted many male attributes. She assumed all the regalia and symbols of the pharaonic office: the Khat head cloth, topped with the uraeus, the traditional false beard and shendyt kilt. She ruled for about twenty years gloriously, during which Egypt witnessed a long period of prosperity. She was also known to be a strong, fair and just ruler. Besides being the only female pharaoh to erect the most monuments during her reign, the projects she commissioned took Ancient Egyptian architecture to higher standards that set the calibre for the pharaohs that succeeded her. 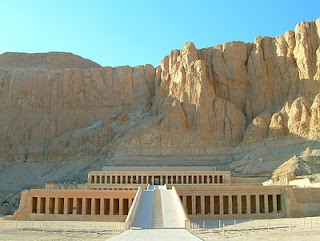 The first and the most beautiful of the temples in the Valley of the Kings was her great mortuary temple Djeser-Djeseru. It is the focal point of the complex at Deir al-Bahari on the west bank of the Nile, opposite the city of Luxor. Although she was known to be a peaceful queen, she made some conquests notably the expedition to the Land of Punt (perhaps present day Somalia) She re-established trading relations that were lost during a foreign occupation by the Hyksos, bringing great wealth to Egypt. The expedition to Punt brought back myrrh, frankincense, woods, sweet-smelling resin, ivory, spices, gold, ebony, ivory and aromatic trees, this was the first ever recorded attempt to replant foreign trees. Hatshepsut was also the first Pharaoh to erect an obelisk; she had two erected in front of her temple yet only one still stands today, as the tallest surviving ancient obelisk on Earth. She is also the owner of “the Unfinished Obelisk” in Aswan as it establishes how obelisks were quarried. With all her success and accomplishments she disappeared from history after about twenty years of her reign. To this day no one knows how and when she died exactly, or where her mummy is buried. However, if the recent identification of her mummy in KV60 is correct, CT scans of the mummy indicate that she died of metastatic bone cancer in her 50s. Depicted in many novels and films, whether as a wicked step mother or a romantic amiable queen, it is undeniable that she was the first great woman in History!